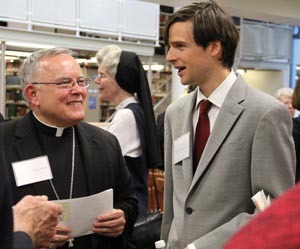 Archbishop Charles Chaput shares a moment with Patrick C. Temple-West, son of the late St. Joseph’s University graduate and NDS founder, Pat Temple-West, May 15 at the university. Patrick Temple-West, the late founding director of the Archdiocese of Philadelphia’s Nutritional Development Services, was recognized May 15 by the establishment of a permanent scholarship in his name by St. Joseph’s University’s Academy of Food Marketing. The recognition is especially appropriate because he was initially on loan to the Archdiocese by the Academy of Food Marketing when he became the director of NDS, which itself is probably the most enduring legacy of the Cardinal’s Commission on Human Relations, established by the late Cardinal John Krol. Pat Temple-West remained director of NDS from the time of its foundation in 1971 until his death in 2009. As an indication of the ministry founded by Pat Temple-West, last year NDS served more than 7 million meals through its child feeding programs at schools and other venues and collected an estimated 2 million meals through its Community Food Program. 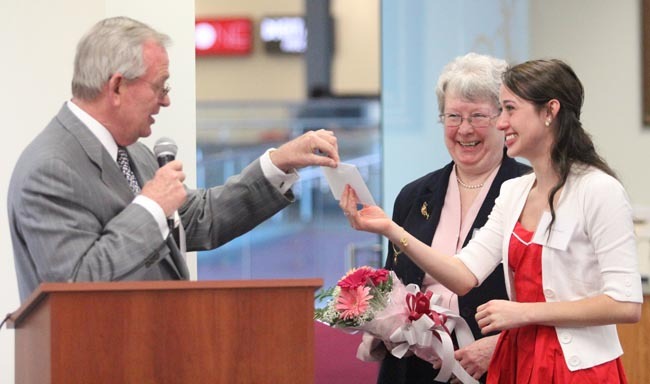 The encouragement, of course, will be through the scholarship, which this year was granted to Food Academy freshman Madison Alexandra Smith, whose submitted essay spoke about ministering to the poor in New York City. The scholarship, as presented by Food Academy Director Robert Higgins, was for $2,500 a year for four years but it was immediately doubled. Dr. Joseph D’Angelo, dean of the Haub School of Business of which the Food Academy is part, immediately offered matching funds, which means Smith will receive a scholarship of $5,000 a year for four years. The match was only for Smith, not necessarily future recipients as well. “We are deeply humbled by this recognition of effort and the work he started and got rolling at St. Joe’s can continue to another generation,” said Pat’s son, Patrick C. Temple-West, who along with his mother, Patrice, and sisters Frances, Anna and Marija, attended the ceremony. One of the hallmarks of NDS is the loyalty of the staff Pat Temple-West gathered that still remains faithful to the mission. Programs initiated by Pat Temple-West became models for similar programs all over the country. His impact in his own city was immense, according to Anne Healy Ayella, a St. Joseph’s University graduate and associate director of NDS who worked with Pat virtually from the beginning. 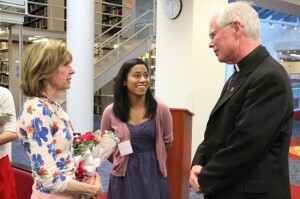 Pat Temple-West’s wife Patrice and daughter Anna meet with St. Joseph’s University president Father Kevin Gillespie, S.J. Indeed most of the other local food agencies had representatives at the program to honor Pat Temple-West. Philabundance, which is now Philadelphia’s largest food agency, began in 1984 and Pam Lawler, the founder, well remembers the assistance Pat Temple-West provided without her having to ask. Thanks to the scholarship Pat Temple-West’s legend will continue at St. Joseph’s where it all began. I was in a seminar class or two with Temple-West. He was exceptionally bright and scholarly. Over the years, I imagined he’d be a playwright, or a politician, an attorney or professor. What a surprise to discover that his Magis was even more centered on the gifts of Christ. I did not know about the accomplishments of my classmate Patrick Temple-West since I am not a Philadelphia area resident. So I found the piece on him to be most interesting. He is a fine example of what a SJU education does for the person and the community. I have always been proud to be a Hawk and this is another reason why! Best wishes to Patrick’s family. I really enjoyed reading this article and the honor to Pat Temple West is so deserved. I was blessed to know the family and extend to them my my deep congratulations. God bless.